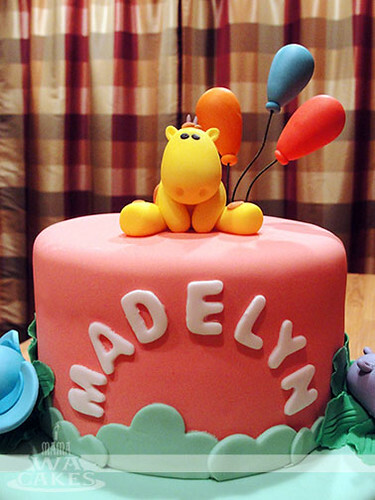 A few weeks ago, I made this cute cake for a girl named Madelyn to celebrate her first birthday. 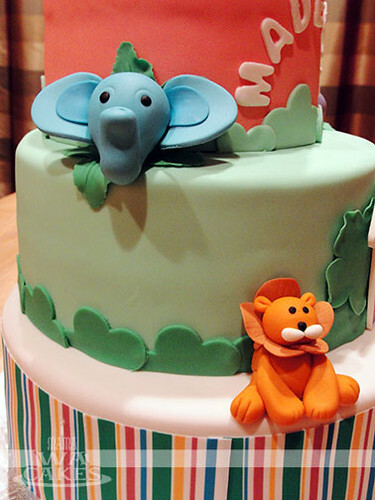 I love making animal themed cakes for young children. All because I get to make the most adorable sugar modeling! Have you seen the giraffe?! I wanna hug that little guy! 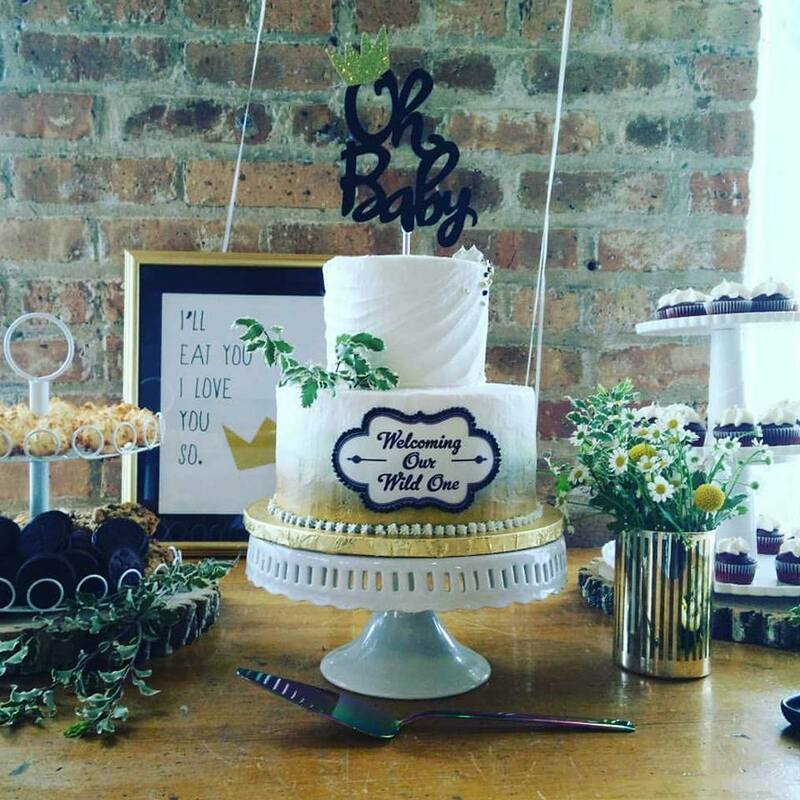 I used the invitation as my inspiration for this cake, from the colors of the animals, to the stripes I printed on edible frosting sheets. A few days prior to baking, I pulled out all my tools and began shaping the cute baby animals. I mixed the colors I need with gumpaste and gel colors, except for black. For black, I used black fondant and added tylose powder. I feel like it takes a lot of gel color to achieve a rich black when starting with white gumpaste. Each baby animal was then shaped starting with the torso, head, and then the limps. Make sure to give each part a few minutes to harden before adding another part, or the shapes will slouch. I then finish each one with facial features and hair. I used cake decorating floral stamens as antlers for the giraffe, genius! With a printed frosting sheet, I also created an edible plaque for the number 1 by adhering the sheet to rolled out gumpaste. Oh! I almost forgot the balloons! I made tear drops for the balloon bodies and a small disc for the balloon openings out of rolled gumpaste. These were then inserted with wrapped floral wire that I bent a bit for movement. 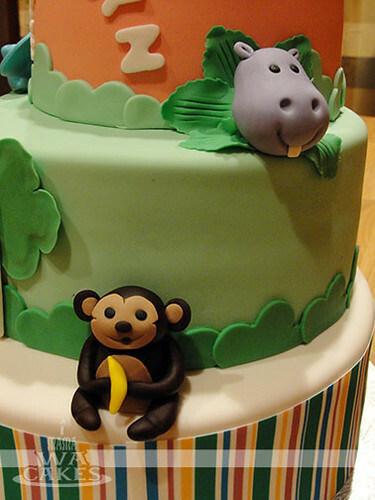 All the animals, balloons, and edible plaque were allowed to dry completely before placing on the cake. Now, time to bake! The cake began as a 10" tier of vanilla cake filled and covered in buttercream. 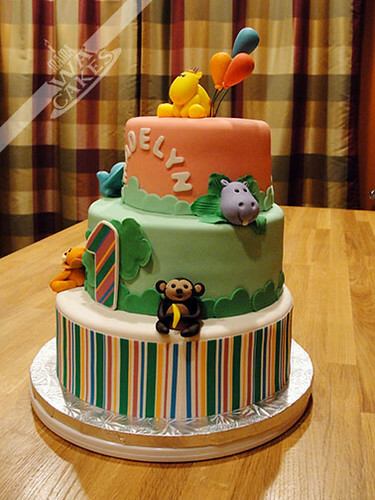 This was then covered in buttercream flavored fondant, and finished with long strips of the striped frosting sheet. I usually attach frosting sheets or wafer paper to small areas with clear piping gel and a brush. But with a big surface like the sides of a cake, I find it easier and faster to just dampen a clean paper towel. Fold it to fit the height of your cake, hold it along the side, and then give the turntable a spin! The second tier is a 8" round chocolate cake filled and covered in buttercream. 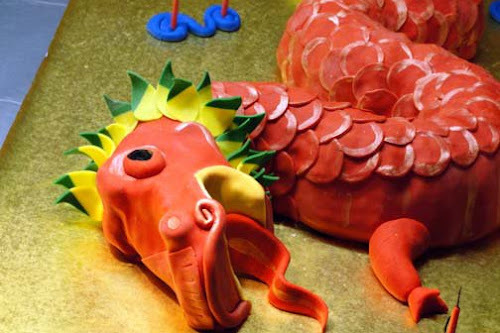 This was then covered in a light green fondant. I then lined the bottom border with what I called cartoon bushes, just like the ones we drew when we were kids. I used a five petal rose cutter and cut out some darker green fondant. I then cut them in half with a spatula to create "bush". I then attached these to the cake with a little water, slightly overlapping one over another. I also flipped the pieces randomly to create some variance. The top tier was also a rich chocolate cake filled with buttercream. This was then covered in a light pink blanket of fondant. 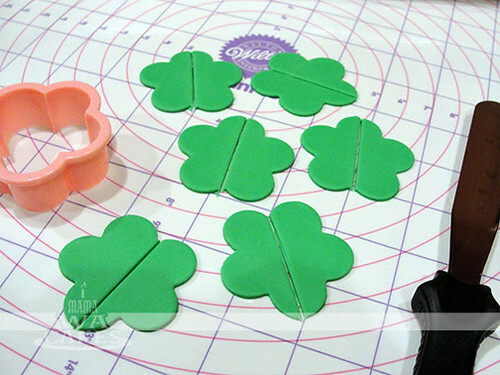 Using the same rose petal cutter method, I cut out a light green that matched the cake below it. This helped tie the top layer into the rest of the cake. 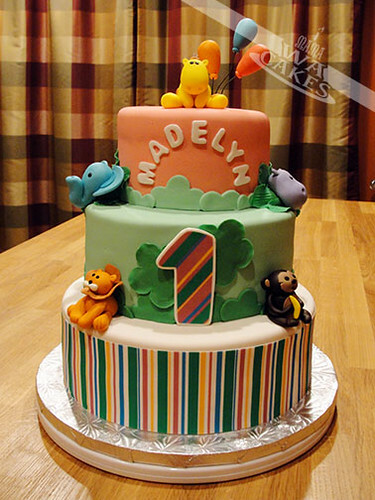 Madelyn's name was then cut of out white fondant, and carefully attached to the cake with a touch of water. 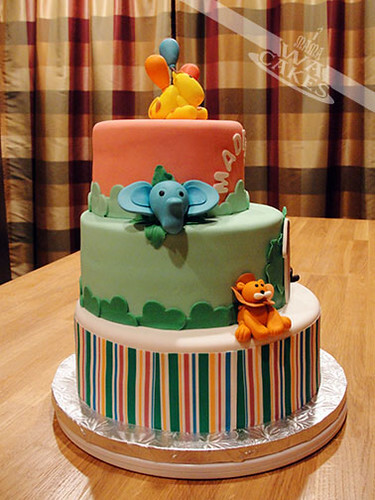 Once all the tiers were completed, I attached the animals and plaque to the cake with piping gel, and added some leaves around the elephant and hippo. I loved the giraffe so much that I had to place it as the topper. 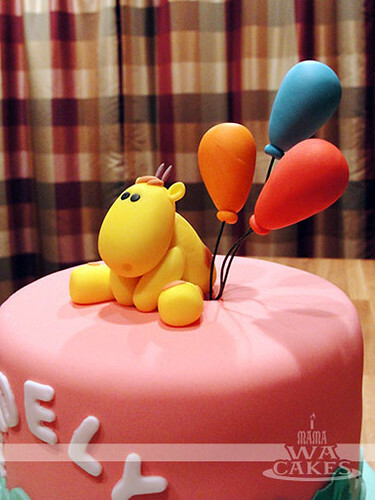 The balloons were then grouped together and inserted into the cake next to the little guy. This cake is ready for a celebration!